If we want to visit anything else in L.A. we should wake up early as we must drive to San Diego before lunch time. One of these visits could be Disneyland in Anaheim, a neighborhood at South in our way to San Diego. 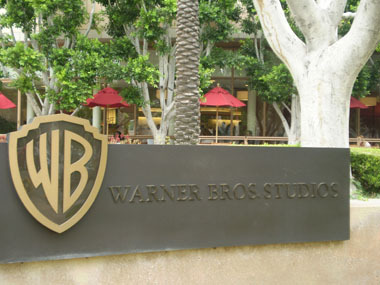 Another one could be to other studios, like Warner Bros, which are close to the hotel. After that, we should get San Diego at lunch time after 1 hour and 15 minutes for covering the 195 Km of distance between these two cities. Once in San Diego, we will visit the Gaslamp Quarter, where there are still buildings from the period where Wyatt Earp and his friends founded a casino in this city. If we have still time, we could visit Balboa Park or at least a part of it, so we could complete the visit the morning of the next day. Waking up early is not for us and we go out from the hotel later than 10:00h, after checking out and asking to the guy in the desk what are the best options to see the Hollywood sign. He has pointed some spots in our map, and it results one of them is the viewpoint in Mulholland Drive we were two nights ago, so I’m driving to there. The views to L.A. city from Mulholland Drive at daylight are spectacular. The city melts into the horizon and skyscrapers from downtown are just silhouettes. Then we take the stairs we avoided at night to get into a small and circled area from which we can see the letters of the sign at the very left of the city. The sign cannot be seen from the viewpoint downstairs because it’s this same kind of tower where we are what is blocking it. We can see those white and misaligned letters far and laterally and we take a bunch of pictures posing with them – some days later, when downloading these photos to the computer I find out the sign is quite unnoticed in the pictures, so it seems we’re posing in front of an ordinary mountain with an antenna. This is the reason the picture I put here below is the only one taken directly to the sign with full zoom - . 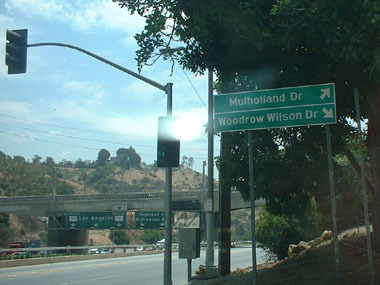 The Warner Bros Studios are across the highway, on the back side of Hollywood sign, so we take the highway in the direction back to the Universal Studios direction for a short ride until the exit. We’ve chosen visiting these studios rather than going to Disneyland because we liked a lot yesterday’s experience and it is a shorter visit: like a couple of hours vs the whole day required in Disneyland. 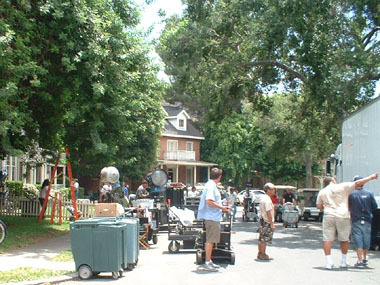 Warner studios is just the sets for movies and TV shows and has no thematic park as Universal’s. We find the Studios easily thanks to the map and the famous water tower of the picture. The studios are huge, but there are signs to drive you specifically to the VIP tour parking lot. It is 5$ for leaving the car, no matter for how long. We walk to the VIP tour entrance guarded by two colossi, as the Egyptian temples are, only this time the gods are Bugs Bunny and Duffy Duck. We want to start by taking pictures to them, but I know they’re not going anywhere and I need to check how this tour works. This is an unscheduled visit and I don’t know about times or even if we’re going to be able of doing it as it is later than I thought now: 12:10h. There is a black, bald and big security guard with the sort of scanner for the bags are in the airports. When we put our bags he asks us where are we from, I answer we’re from Barcelona and he nods. “Do you know it?”, I ask, and he answers, in a very nice mood: “Of course! 1992 Olympic games!”. Then I talk about Dream Team and he shows all his sort of smiles to us. Once we go directly to ask for the tour, avoiding to be distracted by the things we can already see. We’re explained we can be appointed to the 13:00h tour (which will be called at 12:30h) after paying 45$ per person. This is how it works: there is a tour every 30 minutes and people are set to the next available one. There is a one dollar discount coupon for an ice cream and I use it immediately and walk around exploring the items in display as the original costumes from MR. Freeze and first movie of Harry Potter (quite less sizes than in the last movie, I must say). When we’re called, we’re seated in a small cinema room where we can see a documental about the history of these studios and 30 minutes later we’re ready for going out to the street where a young woman driving an electric car for groups introduce herself and give state some rules to be followed by us. One of them is quite exciting, as she is asking us not yelling or gesturing in case we see a known actor or actresses working, as we’re going to pass by some areas where they’re currently filming. She then drives on the streets until going into a complex through a security control where the sets are. In the way she asks about Warner products we’re fans of. I can think about Harry Potter or Batman but I finally mention Friends and Matrix. The first we see is streets and alleys like in Brooklyn: bricked building walls with metal fire escapes. We can see there is a filming going on in one of these streets, but we don’t get closer as per knowing details about it. Actually, the area is limited by this yellow tape for preventing anyone to cross it. In Universal we never saw people working in any shooting, but it was Sunday, it could be the reason. It’s lunch time so the rest of people around has finished their filming work and are clearing up. We reach then an opened area with houses with garden around a circular park with a church and an arbor. A big catering is ready and our guide explains these kinds of celebrations are performed when they finish a season for a TV series. This specific one seems to belong to “Gilmore girls”, but I cannot reckon a single person or thing as I’ve never seen an episode of that show. Somehow, I’ve got the feeling of seeing that park, arbor and church before. They look familiar. It is not strange as we’re being told these sets are used for tons of footage for different movies and TV shows and they look for different angles every time ion order of making it look different. Our guide points one house specifically to me because I mentioned I was a “Friends” fan before and because that was used in the show as Monica and Ross parents’ house. I cannot remember about that, maybe I’m not such a geek. We keep going over sets between facades of building with their closed stores, as if we were driving through a city, only with no people, except for the filming groups here and there. We finally stop in a broad street, looking as a Chicago one, and we know that because the guide is explaining it along with how easily they can change the look of this same street for looking from any other city by changing signs, colors and furniture. There is a big bar which is ready inside too, but we’re going across the street, where we can see, just aside the stairs and door used as Gotham City Hall entrance in front of which The Penguin gave some speeches, a entire hospital. It’s the County General Hospital and the exterior set of ER series, where George Clooney got famous. The group walks into the emergency courtyard with the really fake entrance to the hospital. All are fake doors. You can even see pass ways and doors inside, but they’re still even faker: the doors are directly painted over the wall with the handles stuck on it. The famous automatic door in the picture above at right appears half-open, but it is always looking like this. People passing through it in the show was an editing effect: the part before the door was filmed here and the part after the door was filmed in the studios indoor. Our guide keeps telling stories about George Clooney and the filming of the series with details you never thought about it. For example, the tubes over the courtyard, making concentric squares, were used for making rain here. A short drive in the trolley take us into a parking lot full of vehicles for services: ambulances, police, firemen, shipping… I’m not expected what we’re really here to see is a bar: the “Central Perk”. As “Friends” TV series has a lot of fans they’ve kept the set of the bar were the characters were spending the most of their time. And now I’m in it! Everything is smaller than what it seemed on TV. It’s a pity a tape is there for preventing anyone trespassing a specific line in the floor to get in and sit in the couch or playing Phoebe’s guitar, which is still there, in its place, as can be seen in the picture. This set is in a big building, “hidden” in a small room after a wooden pass way. Then we walk to another building where we can see an exhibition of vehicles from movies produced by Warner Bros. Here we can see the Batmobile used in George Clooney’s version of Batman, and Robin’s motorbike, the “mystery machine” van from Scooby Doo, the weapons and chariot Brad Pitt “Achilles” used in “Troy”, along with the helmet, which is far of being made in metal. In the picture at left, the car beaten by the Whomping Wilow in Harry Potter movies, with the baggage, including Hedwig’s cage. At right, the car used by Morpheus and his people in “Matrix” surrounded by some Smith’s figures – based on the final scenes of “Matrix Revolutions” it must be some hundreds more of them around-. Before leaving this all of us are offered to do a photo in front of a green screen where our guide show to us is going to be set an image of Harry Potter’s steam train in the station to act as we desire with it. Then, we meet another group coming in to the place and we’re called by someone. The man from Texas with his son who did the VIP Experience in Universal Studios with us yesterday are here too, so it seems we’re following twin plans in L.A.
A new trip on the trolley takes us to where the TV series are filmed and we’re going to visit the set of one of them. Somehow, before leaving our vehicle we’re asked for delivering our cameras to be kept in a closet closed with a key kept by our guide. It’s clear: we cannot take any photo or video of what we’re going to see. At the entrance we can see a big logo of the TV show “Two and a half men”. I know what it is, but I’ve never seen an episode. We can even see the caravan with Charlie Sheens’ name here. We seat in the elevated stands in front of the set, which is taking this whole side of this premise long, but it is quite narrow: just around 10 rows for the audience. Our guide explains a lot of stories and details of the filming of a show like this: a comedy with audience which can give hints about the failing jokes to rewrite them on the fly. We can see in front of us a living room with a small garden on the other side of the door at left; a thin wall separates it from the bedroom at right, which has another thin wall separating it from the empty place at the very right. We’re told that space is used following the requirements of each episode and be transformed on a bar, doctor office, etc… in order the audience can have visual access to all the scenes. The sets we can see now are the permanent ones in the show and we can realize about the rooms are smaller than they are supposed to be. Guide explains furniture is custom-made, smaller, to match with the whole set. It seems it looks a lot better in camera this way. Later in my room I could see an episode of “Two and a half men” and I can say what seems perfectly real size in TV looks as a living room for hobbits in live. The next ride stops in front of a building our guide calls “museum”. I’m afraid I’m going to miss a lot the cameras which still haven’t been delivered back to us. 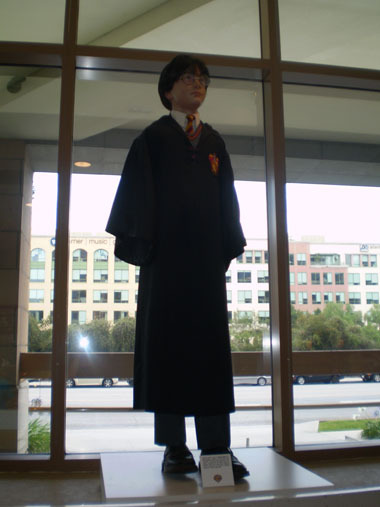 The museum is and exhibition of movie objects. Some security guards are preventing people to take any picture or touching something too much. We explore the place around amazed by the costumes in mannequins and objects in showcases: Batman and Superman ones, Ingrid Bergman dress and Humphrey Bogart suit from “Casablanca”, along with the piano, which looks incredibly small to us. Oscars won by the studios - Best movie to "Casablanca" among them -. Dummies dressed with the original cloths of Morpheus, Trinity and Neo and the connections actors worn in the nape. I look astonished the ostentatious machine used for taking the parasite from Neo and the parasite itself is at its side. Hundreds of things we try to retain as we don’t know how much time we have to be here and we have no cameras for taking a memory from here. But there is still more to come: I can hear the floor upstairs is entirely set for Harry Potter stuff and we go up quickly. No way in retaining all we can see here for the future. 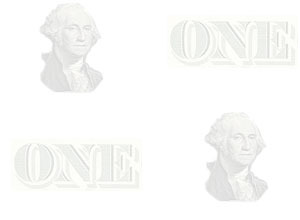 We can barely watch to all of it in the present. The second floor shows all what has been used in the first four movies of Harry Potter, fifth movie is so new as per being here. All the sort of clothes and objects as the trunk with all the elements to play Quidditch with, obviously, the golden snitch, but without wings, as they’re computer added; or the Tom Riddle’s diary as it ended in the second movie: stabbed. I’ve even touched the sorting hat! So many familiar objects which experience with we only could bring in mind. Tour ends with this amazing visit and we go out from the building recalling the experience we’ve just lived. We then make our postposed pictures with Bugs Bunny and Duffy Duck looking at our cameras and thinking “I wished have you 30 minutes ago”. Well, I’m coming back to reality as I must drive but before we put the picture they’ve given to us with Harry Potter’s train in the bag. Nice gift! We take the car and drive to Riverside Drive, our though was lunching in San Diego, but it’s 15:00h now and our stomachs are recalling to us it is already late for lunch. We park in front of an Italian restaurant. I think is the first time we park in this country for free, but this is a big avenue with a few cars, so a lot of space for leaving the car for a while. “Baco Trattoria” restaurant is empty, except for an old man alone in his table. Maybe I’ve seen so many movies but it is recalling to me a typical restaurant from mafia and this is L.A. and we don’t know exactly where we are. Eva and I share one dish of pasta and another one of meat while my sister goes for a big salad with a lot of cheese. Plates are big indeed and we leave the place satisfied by 40$ in total. Now finally we drive to San Diego. It’s late, 16:00h, but it must be a short drive of around one hour. Balboa Park visit definitively is going to be for tomorrow, though. We get lost a little to get Highway 5, which is the way to San Diego, and we find traffic jams in some parts. When we are in the highway for one hour I pay attention to the exit names as I’m expecting finding San Diego one shortly, but the Exit is Anaheim! This is Disneyland exit, so we’re still in L.A.! I don’t know what has happened. Maybe I did my calculations of time between both cities without thinking leaving L.A. across it could take even more time. We can see the Crystal Cathedral far from the highway. I cannot tell what time we’re going to reach San Diego. I can tell now: later than 18:00h. We’ve stopped in a place called “Encinitas” to get fuel but I’ve got lost again when arriving to San Diego, so we’re leaving the car in a parking lot in 6th Street - the next of Gaslamp Quarter one, as it is in 5th Street -at 19:52h. It is getting dark and we just walk along the street up and down. This is an area with plenty of live and there are a lot of people getting their dinner or drinks. All the bars are crowded. Some of the buildings are old and our guide book tells some of them are contemporary of Wyatt Earp, but it’s the only we can see remaining from his figure . We talk about coming here for dinner after checking in at hotel. Before taking the car in the parking I ask about indications for reaching our hotel to the doorman of a fancy hotel, but he doesn’t reckon the street or “California Suites” name so he calls to the bell boy, who doesn’t reckon it either but takes a map in order of looking for the street. How good I asked here as it results our hotel is closest to L.A. than San Diego – I’m exaggerating here -! We must take the highway back to L.A. direction and take some exits at north. Then we will need to ask someone in around there. And sure we ask! A lot! When later, less people to ask. Nobody knows this damn hotel or this damn street. We keep driving around unknown streets completely lost for hours. I call the hotel, but as I don’t know where we are they cannot give me indications. Finally, and “finally” means late night, a man in a gas station can give me clear indications to get this “California Suites” place and we can find the street. The “funny” thing is, while we’re looking at the numbers to find our hotel we find ourselves got into the highway again downtown direction. I need to take the next exit, driving around for a while until getting the highway again back to hotel’s exit. I repeat the exploration of the street carefully and, again, I find the entrance to the highway, but this time I prefer to drive back – no cars at road this late – to finding the “hidden” entrance to “California Suites”, just when the entrance to join the highway starts. Once in the reception desk I’m explaining how hard have been to get the place but they don’t care about it. I’m delivered a map of the complex and a key for accessing the area, which is closing at night. When we’re resting at room we remember about dinner, then we walk around looking for a place. We only find a gas station where we can get some sandwiches to eat at room. I’ve ended sick of car today. In theory, it was going to be a day with just a short drive, tomorrow is the day with the longest one. Let’s go to sleep .